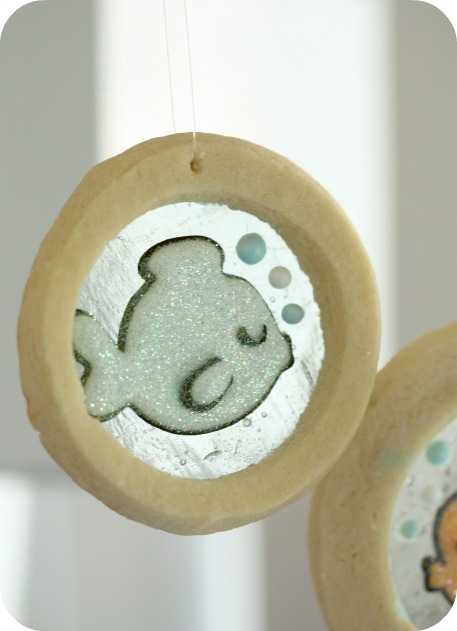 Baby shower cookies with a bath theme. 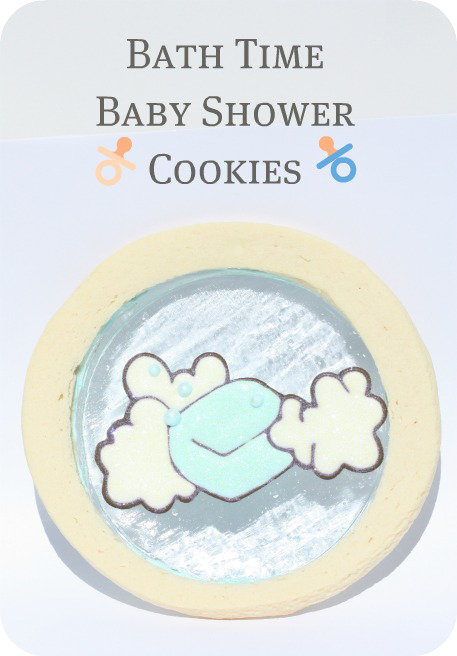 I guess you could call these baby shower, shower cookies. Ba dum dum dum. (I know, groan; sorry). 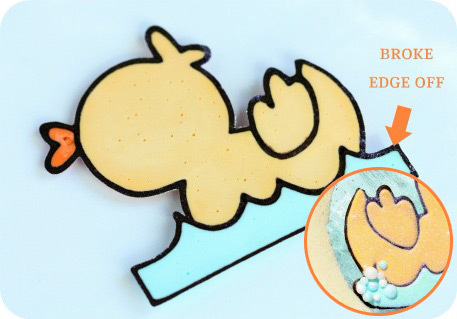 You could also call them ‘candy cookies’, because the center of each one is made of a candy coating called isomalt. 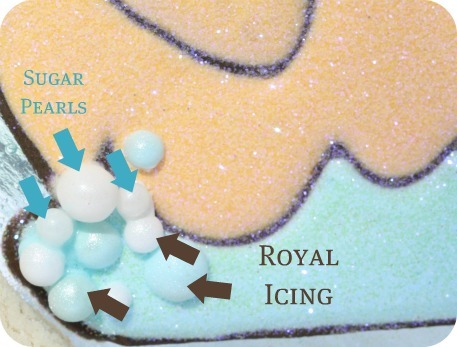 It’s a sugar substitute which can be a used to make all sorts of sweet creations such as candy ‘jewels’ (which really only look clear, not sparkly). If you’d like an easy alternative to boiling sugar or other candies for your confections, isomalt is quick and simple to use. It is also used as a sugar substitute for diabetics, and like most sugar substitues can cause flatulence etc. if consumed in large quantities. Maybe make sure your child or guest doesn’t have more than one cookie. 😉 Or you can use crushed, clear hard candies as an alternative for the center. 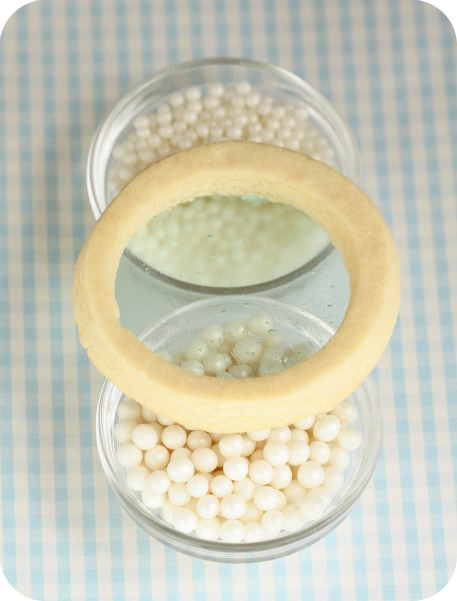 Use a pin to create a little hole in case you’d like to hang the cookies. Bake. Preparing the isomalt involves adding water and melting. See this post here on how to make it. For this batch, when the temperature reached 280 degrees Fahrenheit, I added one drop of light blue paste coloring to tint the isomalt a baby blue. You can also add any kind of flavouring you like! 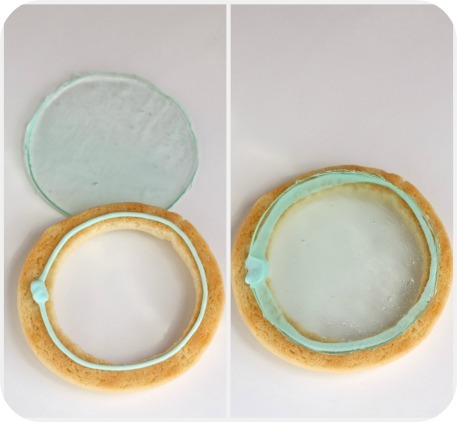 Using royal icing, pipe icing onto the back of the cookie and gently adhere your isomalt shape. Let dry with isomalt side down. 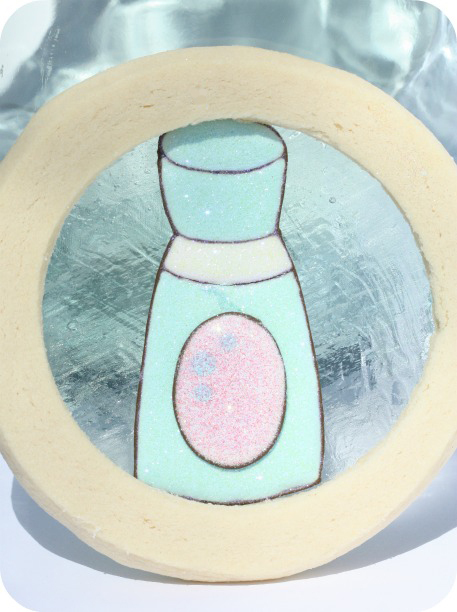 Time to get the ‘bubbles’ ready for your cookies. 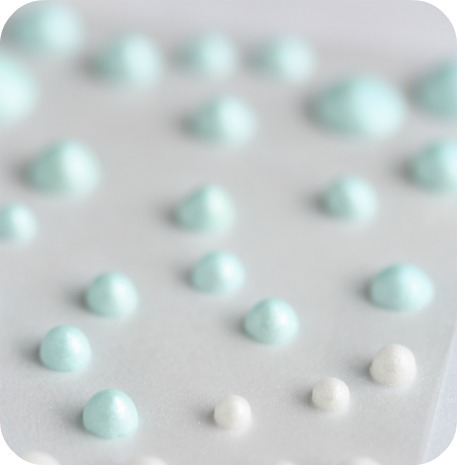 I used these white sugar pearls and made some bubbles of my own using royal icing and PME pearl lustre spray . 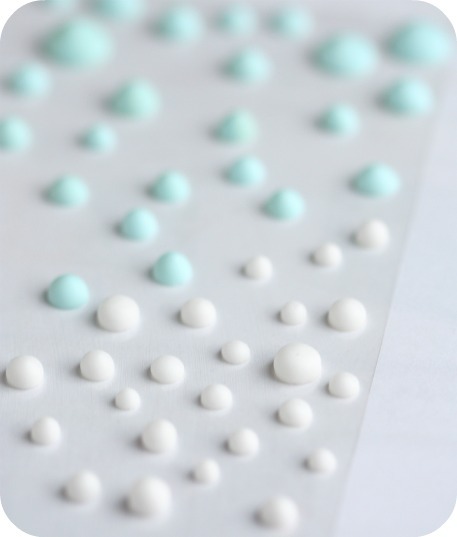 A) Using a number 2 tip, pipe royal icing dots of different sizes and colors (I did baby blue and white), onto slightly greased acetate paper. Parchment or wax paper works too. B) Let them dry and then lightly spray with PME pearl lustre spray. It might be hard to tell in the picture, but it gives them a little bit of a shine. Pipe the outline using a #2 tip. 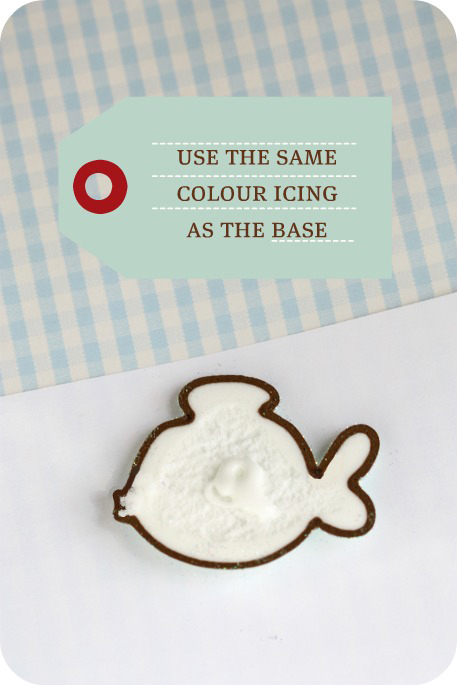 (For more information on making royal icing designs, see this post here). The packaging is long gone, so I can’t remember what brand they were, but I bought them at Michael’s Craft store. (If you know the company name etc., I’d love it you’d leave the info. in a comment below). For a detailed tutorial on using the Kopykake projector, click here. 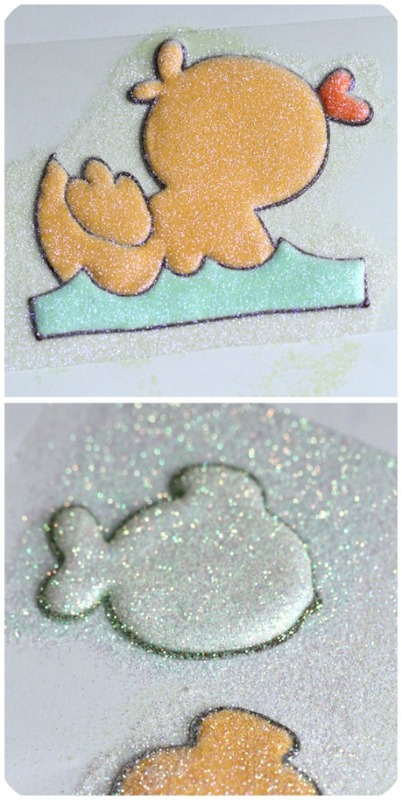 Fill in the shape with royal icing and sprinkle disco dust on them right away. 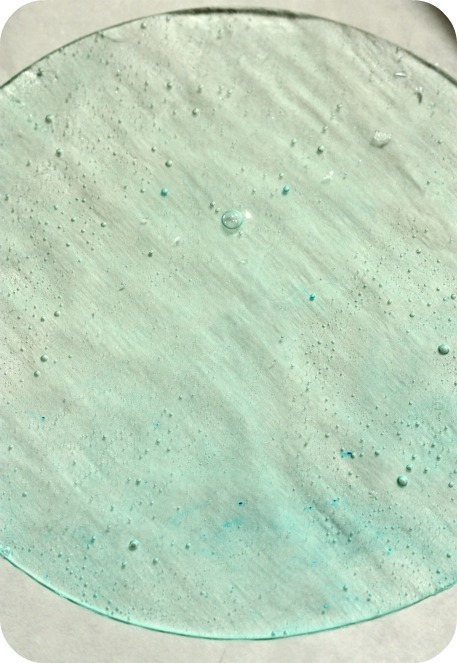 When the icing is dry, gently shake off the excess disco dust. As an aside, I’m I’m looking forward to sharing some info. with you on disco dust FDA approval. 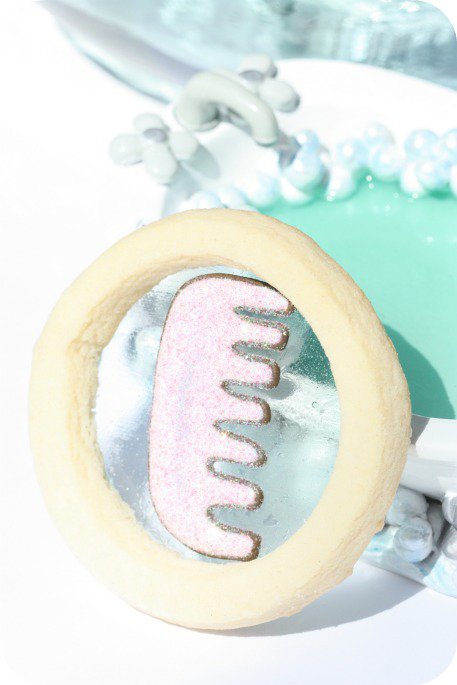 I love using it and am happy to finally hear concrete news from Pilar of Sunflower Sugar Art, that their disco dusts have been given FDA approval. I’ll share more information when she passes the paperwork on to me (She’s in Spain right now, lucky girl!). 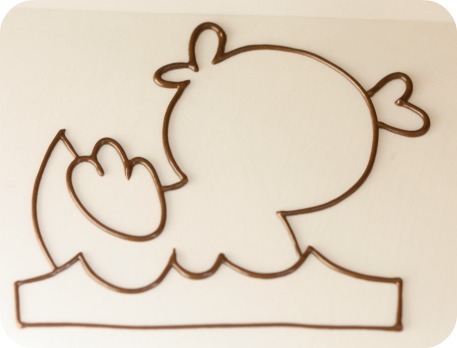 Apply a small dab of icing to the back of the royal icing decoration, and gently place it on the isomalt background. 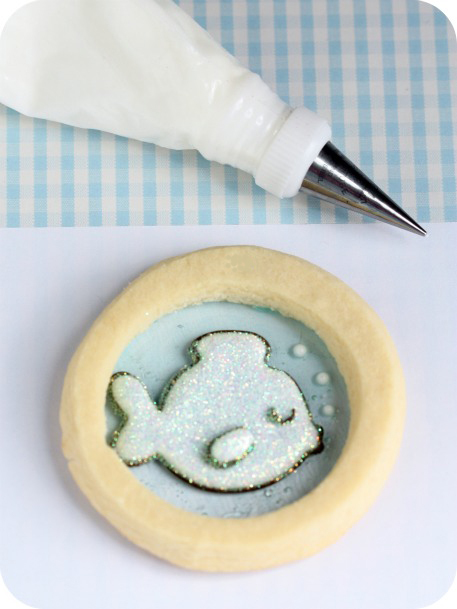 Adhere bubbles with a tiny dab of royal icing. In the end I just re-piped that corner of the outline, filled it in with icing and a few bubbles covered up some tiny cracks. 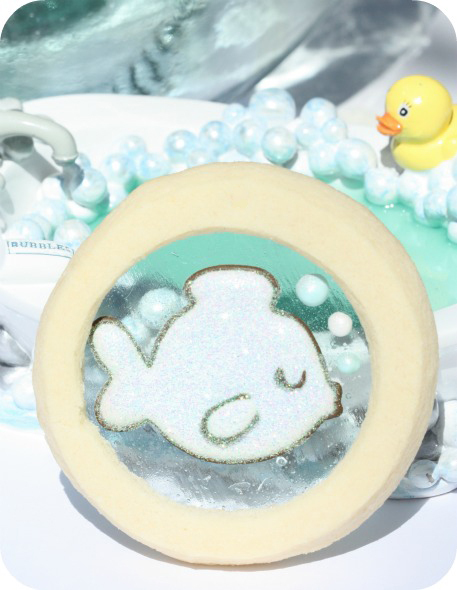 These cookies would be fun to hang in some sort of a display or prop up against something, like this little bathtub I have here, so that the light shines through the candy. 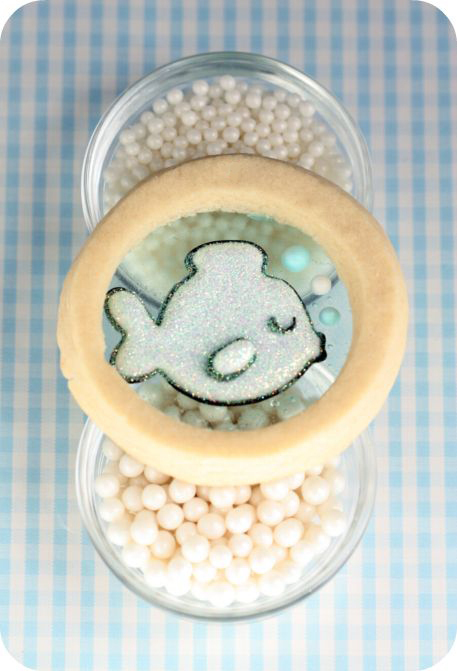 I was thinking this type of cookie would be perfect to create a fish-bowl cookie. 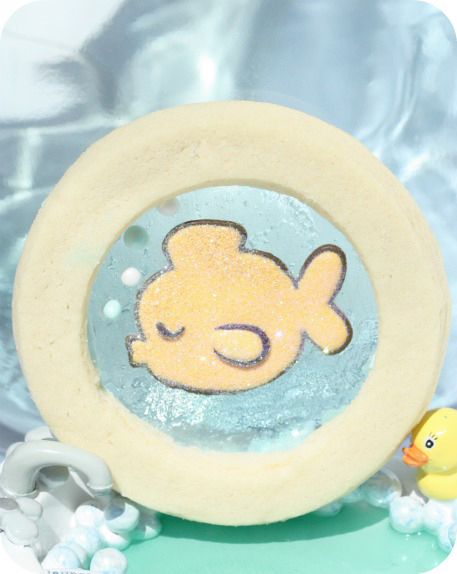 You could make a fish bowl shape with sanding sugar ‘sand’ at the bottom, pipe starfish, seaweed and little fish on the isomalt. If you decide to make them, send me a link/photo; would love to see what you come up with! Taste-wise, with the combination of cookie, candy and royal icing, you’ll certainly get your dose of sweetness. 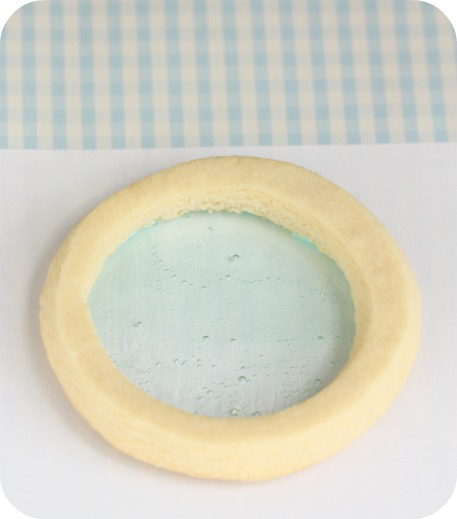 You may also like to see more baby shower cookie ideas in this post here. I hope you enjoy making these too. They are definitely a little more effort to make, but so fun to create! If you have any questions or comments, please drop me a line below and come join me on facebook here. p.s. 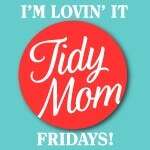 Come join the fun at TidyMom’s I’m Lovin it Fridays! I keep trying to think of what to write… I am at a COMPLETE loss for words. These are so insane!!! I adore you… AND THEM!! Thank you for sharing. I can’t imagine ever making them to sell, but I would love to gift them to someone. Just magnificent!! Thank you for sharing!! Oh my God! Marian it’s fantastic! ITs not just cookies, its ART! WOW. These are incredible. You have such an amazing imagination to dream up so many beauties. I’ve done a similar technique to make windows in gingerbread house that may save a few steps. I put broken pieces of hard candy in the middle of the raw dough before putting it in the oven. (have your cookie sheet lined with foil for easy removal without breaking the glass) Over the years I’m pretty familiar with the amount needed to fill a space. Of course it might be hard to find candy in that lovely shade of pale blue, but this might help someone. I would like to begin by thanking you for your fantastic blog and all the help you are providing to new decoraters everywhere! Your work is flawless and amazing! I have been decorating cookies since last Christmas and can’t get enough of it.Thank you,you provided all the info and how-to I needed! I’ve been looking at cookies on the internet and have recently seen a few where they accomplish a lacy/see through effect. How do you do that? Looking forward to your reply. Thanks Christine; so nice of you! Would you be able to put a link here to an example please? That’ll help give me a better idea to what you’re looking for. Wow, Marian! Those are SO cool!!! These are absolutely amazing. I wish I had the patience to do something like this because WOW! 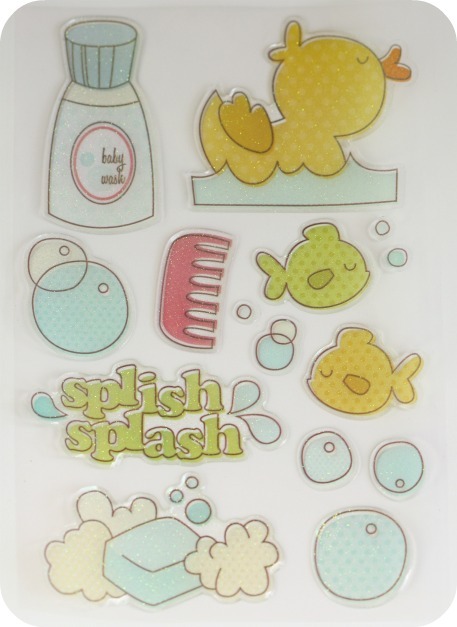 These are so darn cute and the concept for the design is genius!! These are adorable! Went to a baby shower recently Wish I had had these with me. thanks for the very nice detailed tutorial! they look so cute!! I don’t know if anyone has said this already, but if you don’t have isomalt or want some flavor to the cookies, you can use blue jolly ranchers! The color will be much darker, but it still looks cool, and is flavored! 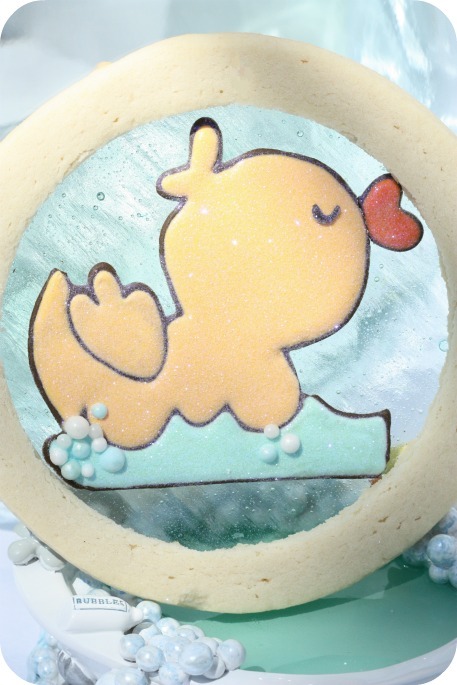 I love the idea of these cookies, they are so cute!!!!! and when you have to do several pieces for christening will take many hours. You are a champion ! I like your Blog from France ! Thanks you very much. I wonder if you could put blue food colouring in your dough and then make the cookies so that there was a frame of blue around the water? These are simply amazing. Stunning, really! Just curious as to how far in advance these can be made. Any ideas? Freshest is best of course but I keep mine max up to two weeks. If you’re pressed for time you could make ahead and freeze too. There’s a post on that in my tutorial section. It’s really great. I put a link to your article on my french blog. HEy! 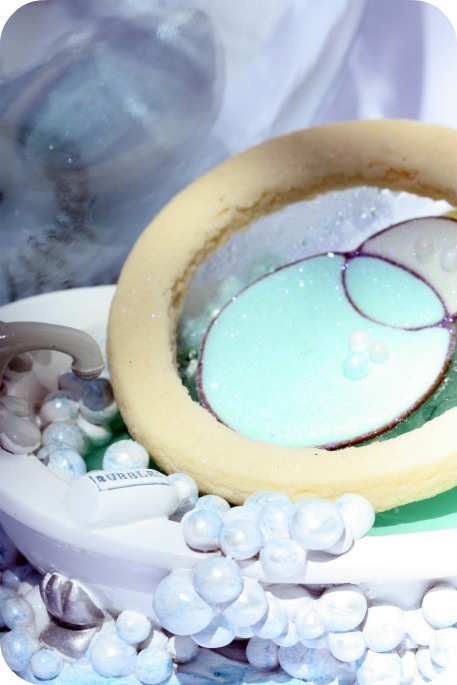 Where can I buy Isomalt? These are CUTE! Call me crazy but I didn’t think isomalt was very safe for consumption???? 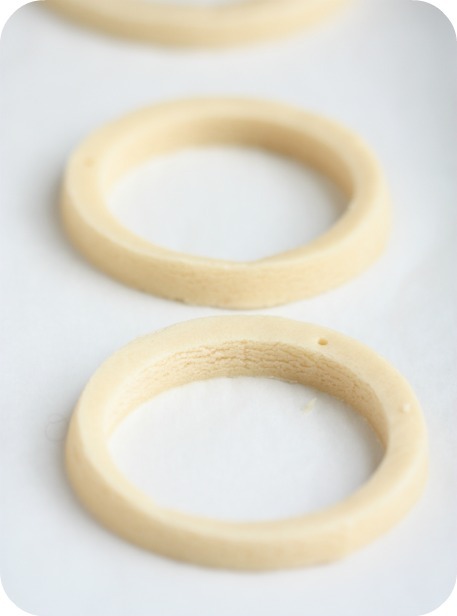 So the step of forming your “glass” circle was done with Isomalt and a form for it. Sorry I’m a newbie. Was just wondering what you used.